ℹ Mass gainers or weight gainers are products featuring several nutrients that are mostly characterized by large amounts of carbohydrates like dextrose and maltodextrin, and by their considerable caloric content. Besides carbohydrates, they contain protein and in many cases also other ingredients, such as creatine, arginine and other amino acids, vitamins, minerals and plant extracts, to which specific properties or special characteristics are conferred. 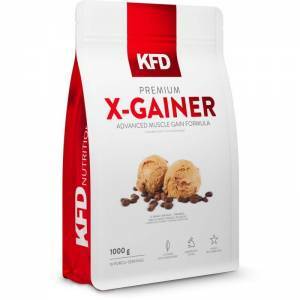 KFD Premium X-Gainer is a combination of high-quality carbohydrates mixed with two types of protein. The proteins included in the anabolic matrix of X-Gainer are whey protein concentrate and mycelial casein. Hi-Mass Gainer was designed to be so nutritionally dense that it is virtually impossible not to grow while consuming this superior next generation gainer. Packed with 56 grams of protein and almost 230 grams of carbohydrates per serving, Hi-Mass Gainer will turn you into the monster you have been training hard to become. Stop holding back. Start growing now!